Gyro Monorail designed 1907 by Brennan and Scherl. Test track built 1910. A monorail is a rail-based transportation system based on a single rail, which acts as its sole support and its guideway. The term is also used variously to describe the beam of the system, or the vehicles traveling on such a beam or track. The term originates from the contraction of the words mono (single) and rail. Colloquially, the term "monorail" is often used erroneously to describe any form any elevated rail or peoplemover. In fact, the term solely refers to the style of track, not its elevation. 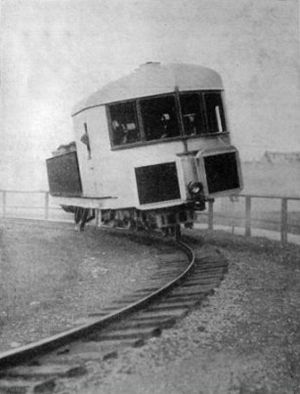 The train is gyroscopically stabilized. This was tried only during a demonstration project in London in 1910, so it must be regarded as an historic curiosity. The train is suspended under the rail, below a bracket which has the wheels in its upper part. (See picture at right) This method is used by the monorail in Wuppertal (from 1901). A wider definition is used in the real world: The rail track is so narrow in comparison to the width of the train that the train cannot obtain the required stability by merely positioning its center of gravity judiciously above and between two rails. If it is to run upon the rail track, it also needs supporting wheels running against the sides of the rail track. This results in a rail track which is narrow and with some height, so that it can be shaped as a rigid beam. This can be held up by vertical columns, and thus go above the unevennesses and activities of the ground level. Straddling trains: The train straddling the beam sits in a stable position, safe against derailing, as each wagon is split at the bottom, stretching somewhat downwards on each side of the beam. The beam for this type (also called type Alweg - after the Swedish businessman Axel Lennart Wenner-Gren) prevents vertical transport of passengers from and towards the ground. Suspended trains: The train hangs below a few 2-4 wheel boogies running on two rails inside the hollow beam. Therefore wagons (or an elevator built into a wagon) can be hoisted up and down with arriving or departing passengers. 6 Better than conventional rail? Unconventional railway types have been invented and tried out since the 19th century. The aim has usually been to make the trains more efficient, faster or cheaper to build than the conventional trains. Some inventors tried to make a rail track with only one narrow rail, upon which double-flanged wheels could run quite reliably. Some designs had wagons above the wheels, and some had the wagons hanging below. The most important pioneer projects will be mentioned in the description of the two monorail types. Being a symbol of the fantastic future, has been both an asset and a liability for the monorail. When The Walt Disney Company built a monorail (type Alweg) in the amusement park Disneyland in 1959, the transport type was demonstrated in a convincing manner for many visitors, although with a rather short track length. The use of monorails in Disneyland and similar amusement parks have caused monorails, in people's minds, to be associated with fun rather than serious transport. The popular press has for a long time presented monorails as the transport of the future, but often together with personal rocket belts or space vacations, leading to confusion about what is useful and what is fancy. The straddling type (Alweg) is the commonest type, and a forerunner for this was built in Listowel, Ireland, in 1888. The track is a beam, normally 60-90 cm. broad. It is compact, and normally made of reinforced concrete. The train has rubber wheels running on the top and along the sides of the beam. The compact beam constitutes a barrier which restricts the flexibility of this monorail type in several manners. First of all, track switching is problematic, leading to trains going back and forth on the same line, or trains needing loops in both ends of a fixed line. The beam is also a barrier preventing vertical movement between ground and rail levels. This monorail will then need complex stations with elevators and stairs for entering and leaving passengers, and it may for security reasons be required to have a fenced gangway along the track. The track may go down to the ground level at stations, but this necessitates a large fenced-off area. A conventional railway upon an elevated track, can easily be confused with the straddling type, but it will be unsafe with regard to derailing, and it will need a large and expensive platform system. Both rail types are uncovered and elevated, so they are likely to be disturbed by snow and ice, and attract birds, leading to some bird massacres. Section of a beam for suspended trains. The orange part in the middle is the power wire, mounted in plastic. Special suspended monorails for transporting goods have been much used in factories and mines. The SAFEGE type beam is hollow, and the wheels run inside it as depicted at right. Such a beam cannot be made of concrete, but of steel. Swedetrack in Sweden gives much technical details about their (suspended) beamway concept, and they calculated that the distance between the beam-supporting poles had to be 30 meters when the beam section dimension was 80x80 centimeters and the load was 7 tons. But a long train can be designed with a semi-rigid spine functioning as a supplementary beam, stretching from pole to pole, and this is one of the possibilities (discussed here) for increasing the pole separation and/or the train weight. A special kind of beamway/monorail has trains running on both sided of a rather tall beam. Two important types are OTG and Futrex. This variety can be regarded as being intermediate between the straddling and the suspended types, and has the important property that the beam isn't a barrier between the track and ground levels. 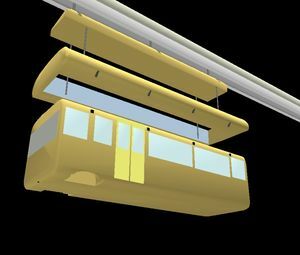 The suspended monorail can also have the wheels running upon a thin beam which is rather like a horizontal cable, held up by several vertical suspender cables going down from a catenary suspension cable. This resembles the common suspension bridge, but the monorail needs only one suspension cable, held up by a sequence of relatively few towers rather than many poles. The standard span length is 600 meters, but this can be extended to a few kilometers if needed. Some of these designs have been tried, resulting in the Aerobus. 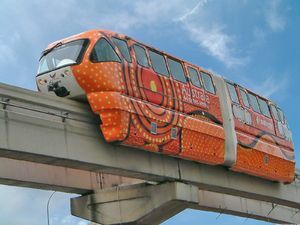 The suspended monorail hasn't the barrier which the straddling train has below it, so suspended trains can have elevators. These are valuable for avoiding the need for many expensive station buildings - each needing an elevator - and for permitting emergency evacuations almost anywhere. Also cabins may be hoisted to and from the ground level. As the suspended monorails hold cabins by the top, and alternative means of transport can hold cabins on a platform, the monorail can easily exchange cabins with other vehicles, boats etc., as these may be only centimeters/inches away. Passenger cabins can be lowered from a suspended monorail to suitable road tractors, goods wagons, boat decks etc. 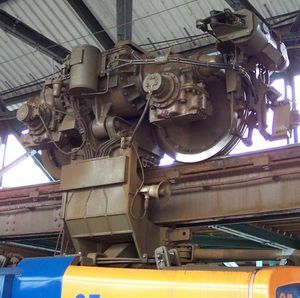 A suspended monorail beam can be moved sideways (straddling) upon two Alweg beams. This arrangement acts like an XY-scanner for automated agriculture. Trains are normally pulled by electric motors which can be mounted in the wagons, or, for suspended monorail, on bogies inside the beam. Locomotives are often omitted in modern trains, but they be useful for achieving a good weight distribution: The monorail train weight should be distributed along a long beam stretch. A propulsion type expected in the future is the linear motor, with magnets on the train and electromagnets along the beam. 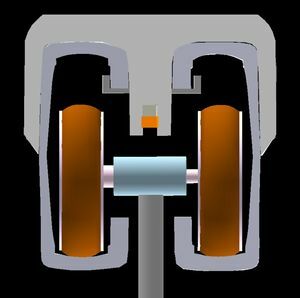 These will then have functions corresponding to the rotor and the stator in an ordinary electric motor. A similar interaction between moving and stationary magnets can be used for lifting up the train; It is easier to achieve high speeds if wheels are avoided. This is called Maglev - magnetic levitation, and they can run at up to 500 km/h. The still experimental maglev trains (like the German Transrapid - depicted at right) can partly be regarded as monorails. This is because such trains ensure stability by clinging to their rails, but are unable to achieve the beam strength and train lightness needed for efficient elevated operation. The main advantage of the monorail is that it reduces the ground space consumption (and ground razing) by 99 %, and to very small extent disturbs other traffic and activities. It can e.g. share bridges and narrow valleys with roads. Elevated trains can find many shortcuts that roads are unable to use. More hill-climbing capabilities are needed for following the roads, but the lightweight trains can easily manage this, especially the suspended trains, which can pinch their steel track with weather-shielded rubber wheels from above and below. It may be regarded as a weakness that it is awkward for passengers to get up to the track level. But if there really is room in the station area, the track can there easily go near the ground level. 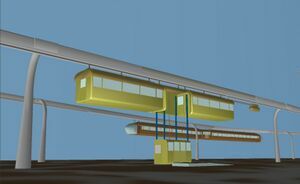 A monorail can easily be rerouted to a more convenient location - particularly a suspended monorail with steel beams held by movable racks. Temporary lines, for events like winter olympic games, may then be feasible. Rerouting a conventional railway line in this manner will be very expensive and environmentally brutal. The monorail may be regarded as a response to a dilemma plaguing railway systems. They attempt to be two systems in one: Passenger transport with 6-8 tons in a wagon, and freight transport for 12-15 times heavier loads. When only the light transport needs high speed, why not relieve the old railways of the high-speed passenger traffic which disturbs efficient freight transport so much? A lightweight monorail can be upgraded for mediumweight freight by adding extra columns and suspension cables. The potential of the monorail - and especially the suspended type - has only to a small extent been exploited: Features like elevator, lowerable cabins, side-shiftable beams, high-speed operation and long-distance lines are features not yet actualized for monorails. Osaka has the world's longest monorail track: 23.8 km. The list also contains monorails lines which (2010) are under construction. This page was last modified 13:04, 6 January 2014.